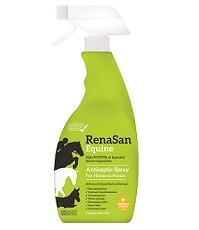 Packed in a 750ml trigger spray for equestrian use. Use against the bacteria and infections that cause or are associated with mud fever, ringworm, scald, thrush and many more. Perfect to use on cuts and grazes to prevent infection on horses and ponies. Cuts and wounds: Spray liberally onto affected area at least twice daily and allow to dry naturally. Try to prevent your animal licking area for one minute after application.